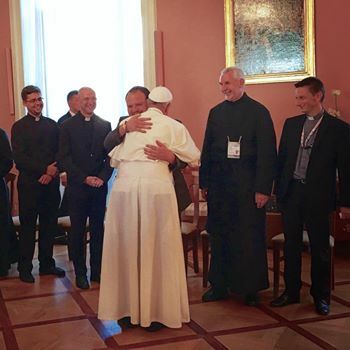 During his Apostolic Trip in Poland on the occasion of the 31st World Youth Day, July 30, 2016—first vespers of St Ignatius of Loyola—at 5 p,m., Pope Francis met with a group of 28 Polish Jesuits belonging to two Provinces of the Society of Jesus of the country and two lay collaborators, accompanied by the two Father Provincials, Fr Tomasz Ortman and Fr. Jakub Kolacz. 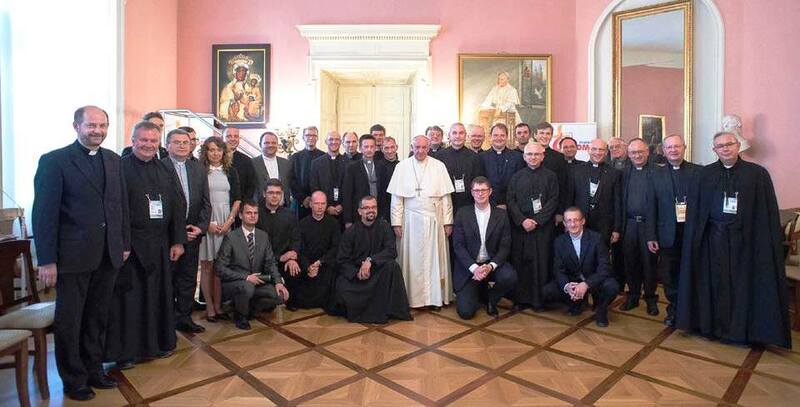 Attended also the meeting other three Jesuits: fr. Andrzej Majewski, Vatican Radio’s director of programs, fr. Federico Lombardi, at that time director of the Press Office of the Holy See, and fr. Antonio Spadaro, editor in chief of La Civiltà Cattolica. The encounter occurred at the Archbishopric of Krakow in a climate of great simplicity, spontaneity and cordiality, and though it was not devoid of meaningful content to the Order, it also held meaning for the Church more in general. Francis greeted everyone present, one by one, and he focused in particular on those he had known in the past. When he was seated and began the dialogue, listening to the questions posed and answering in Italian, Fr. Kolacz translated his words into Polish, even though the majority of those present understood Italian well. Then the Pontiff received some gifts. Before concluding the encounter, lasting a total of 40 minutes, the Pope wanted to add a recommendation easily understandable in connection with his recent Magisterium. With the Holy Father’s approval, we report here the dialogue, in its immediacy, just as it happened, even preserving some personal memories. It is intended as a witnessing that—as you will read—even gathers some impressions of the Pontiff’s experience with the young people of WYD and also provides meaningful pastoral lines. Your message gets to the heart of the young people. How do you speak to them so effectively? Could you give us some advice for working with youth? When I speak, I must look people in the eyes. It isn’t possible to look in the eyes of all of them, but I look into the eyes of this one, of this one, of this one….and everyone feels I look at them. It is something that comes to me spontaneously. This is how I do it with the young people. But, then the young people, when you speak with them, ask questions…..Today at lunch they asked some questions….They even asked me how I go to confession! They have no discretion. They ask direct questions. And you always need to answer a young person with the truth. A young man asked me: «How do you confess?». And I began to talk about myself. He said to me: «In my country there were scandals tied to priests and we do not have to courage to go to confession with these priests who have lived these scandals. I cannot do it.». You see: they tell you the truth, at times they reprimand you…Young people speak directly. They want the truth or at least a clear «I don’t know how to answer you». You never find subterfuges with young people. So with prayer. They asked me: «How do you pray?». If you answer with a theory they remain disappointed. Young people are generous. But the work with them also requires patience, a lot of patience. One of them asked me today: «What should I say to a friend who does not believe in God so that they can become a believer?». Here, you see that at times young people need «recipes». Then you must be ready to correct this attitude that requires recipes and ready answers. I answered: «See that the last thing that you must do is to say something. Begin to do something. Then he or she will ask you explanations on how you live and why». Here, you must be direct, direct with the truth. What is the role of the Jesuit universities? A university as a straight line from the Jesuits must point to a global formation, not only intellectual, a formation of the whole human person. In fact if the university becomes simply an academy of ideas or a «factory» of professionals or a mentality centered on business prevails in its structure then it is truly off the path. We have the Exercises in hand. Here’s the challenge: take the university on the path of the Exercises. This means risking on the truth, and not on the «closed truth» that no one discusses. The truth of the encounter with people is open and requires that we let ourselves make enquiries truly from reality. And the Jesuit university must be involved with the real life of the Church and the Nation: also this is reality, in fact. A particular attention must be always be given to the marginalized, to the defense of those have more need of being protected. And this—it is clear—is not being a Communist: it is simply being truly involved with reality. In this case, in particular a Jesuit university must be fully involved with reality expressing the social thought of the Church. The free-market thought that removes man and woman from the center and puts money at the center is not ours. The doctrine of the Church is clear and it must move forward in this sense. There are some recently ordained priests in this group. Do you have advice for their future? You know: the future is from God. The most that we can do is the feasible. And the feasible are all of the bad spirit! An advice: the priesthood is truly a great grace: your priesthood as a Jesuit is soaked in the spirituality that you have lived up to now: the spirituality of the Suscipe of St Ignatius. I want to add something now. I ask you to work with seminarians. Above all, give them what you have received from the Exercises: the wisdom of discernment. The Church today needs to grow in the ability of spiritual discernment. Some priestly formation programs run the risk of educating in the light of overly clear and distinct ideas, and therefore to act within limits and criteria that are rigidly defined a priori, and that set aside concrete situations: «you must do this, you must not do this.». And then the seminarians, when they become priests, find themselves in difficulty in accompanying the life of so many young people and adults. Because many are asking: «can you do this or can you not?». That’s all. And many people leave the confessional disappointed. Not because the priest is bad, but because the priest doesn’t have the ability to discern situations, to accompany them in authentic discernment. They don’t have the needed formation. Today the Church needs to grow in discernment, in the ability to discern. And priests above all really need it for their ministry. This is why we need to teach it to seminarians and priests in formation: they are the ones usually entrusted with the confidences of the conscience of the faithful. Spiritual direction is not solely a priestly charism, but also lay, it is true. But, I repeat, you must teach this above all to priests, helping them in the light of the Exercises in the dynamic of pastoral discernment, which respects the law but knows how to go beyond. This is an important task for the Society. A thought of Fr. Hugo Rahner has often struck me. He thought clearly and wrote clearly! Hugo said that the Jesuit must be a man with the nose for the supernatural, that is he must be a man gifted with a sense of the divine and of the diabolical relative to the events of human life and history. The Jesuit must therefore be capable of discerning both in the field of God and in the field of the devil. This is why in the Exercises St Ignatius asks to be introduced both to the intentions of the Lord of life and to those of the enemy of human nature and to his lies. What he has written is bold, it is truly bold, but discernment is precisely this! We need to form future priests not to general and abstract ideas, which are clear and distinct, but to this keen discernment of spirits so that they can help people in their concrete life. We need to truly understand this: in life not all is black on white or white on black. No! The shades of grey prevail in life. We must them teach to discern in this grey area. The Suscipe is a prayer that St Ignatius inserts in his Spiritual Exercises within the so-calledContemplatio ad amorem (n. 234): «Take Lord, and receive all my liberty, my memory, my understanding, and my entire will, all that I have and possess. You have given all to me. To You, O Lord, I return it. All is Yours, dispose of it wholly according to Your will. Give me Your love and Your grace, for this is enough for me». Recall that even Benedict XVI recommended the IgnatianSuscipe responding to a seminarian during a visit to Major Roman Seminary, February 17, 2007. Here the Pontiff refers to a test of Hugo Rahner that arose following a study session on Ignatian spirituality. The most recent Italian edition is the following: Come sono nati gli Esercizi. Il cammino spirituale di sant’Ignazio di Loyola, Rome, Adp, 2004. Francis here was referring to the reflections that Hugo Rahner wrote in chapter eight of the volume. We note that chapter three of the same study was cited by Blessed Paul VI December 3, 1974, speaking to the 32nd General Congregation of the Society of Jesus. This entry was posted in articolo and tagged #seminarians, #University, #WYD16, #youngpeople, discernment, jesuits, papafrancesco, popefrancis. Bookmark the permalink.